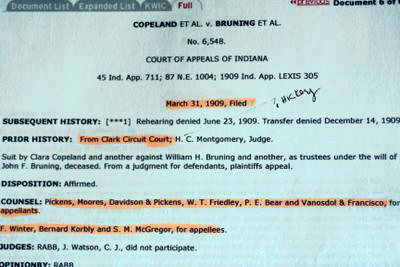 Above: Newspaper print of W. M. Copeland himself from the April 1895 trial in Indianapolis. Copeland was found not guilty by reason of temporary insanity because of his wif'e's scandalous testimony. Above: Clara's woodprint from the trial right before she declared on the stand that her brother William H. Bruning had raped her as a child. She claimed that her recent admission of this to her husband Copeland had made him temporarily insane enough to attempt murder. ... in 1859, always eager to get ahead with his mouth. After being elected twice as the Indiana congressman from Madison Indiana, he met and married Clara Bruning much to her parent's and brother's disapproval. They viewed him as without business acumen but adept at quarreling. The two married anyway, though the pair were forced to live with her parents for a decade because they had no income of their own. Father John Bruning wanted Copeland kept far away from the family money in the Bruning and Sons Coffee, Tea, and Spice Company. Left: Handwritten Copy of W.M. 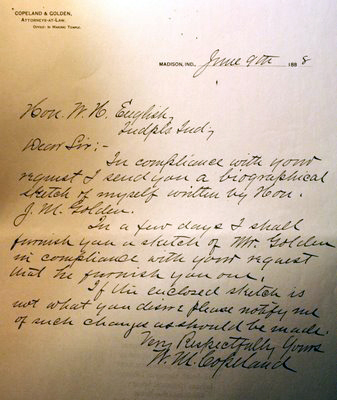 Copeland's request to W. English regarding his Autobiography in 1888 Indianapolis. When Father John died in 1891 leaving Clara's brother William in charge of the family assets and business, Clara threw a fit. 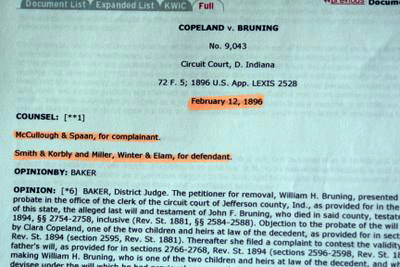 She and Copeland began filing multiple lawsuits and refused to move out of the family home in Madison. Things came to a head in 1894 when Clara told her husband of an old family scandal and he went to Indianapolis and tried to murder William. These two woodprints are from the April 18, 1895 Indianapolis Sentinel newspaper which headlined the scandal for three weeks. The story made it around the nation even being featured in the New York Times. 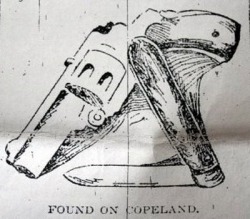 Right: The gun and knife belonged to W. M. Copeland's and were used to shoot William H. Bruning in the mouth and arm. Above: After the Indianapolis trial, Clara and Copeland moved to Chicago where he had an office in the brand new Marquette Building. 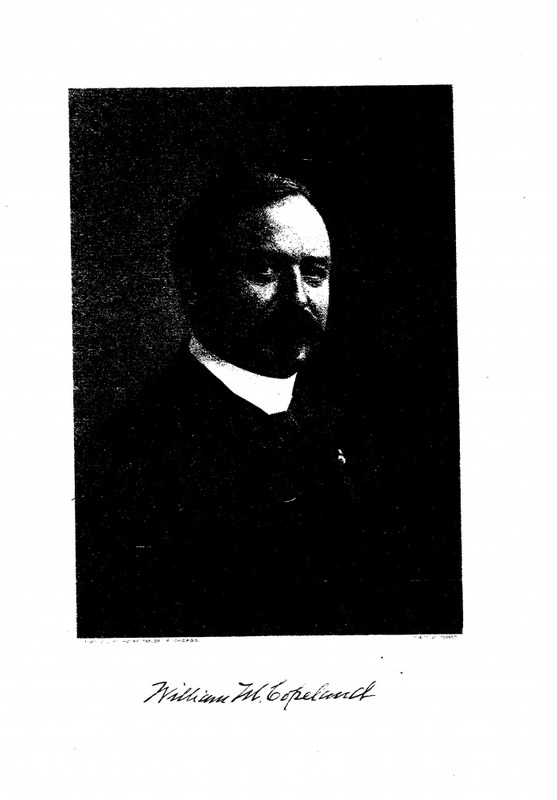 The picture was printed in the the Historical Review of Chicago and Cook County. To view a complete text copy click here. Above: The Copelands continued their decades long fight with William in court over their father's will. This appeal is dated Feb of 1896, less than one year after Copeland was declared temporarily insane and exonerated for attempted murder of William. Above: The Copelands are still filing lawsuits against William and his company ten years later in 1909 even though their father has been dead for almost fifteen years. 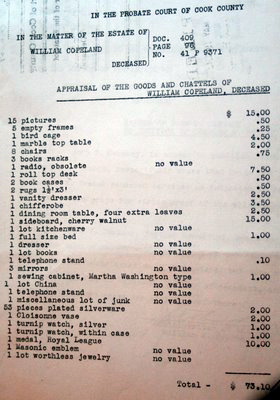 Left: Probate Will of W. M. Copeland from Cook County Chicago. Copeland died nearly broke although he managed to buy spectacular burial slots for himself and Clara. William and Nelle never got over their fear of the Copelands and kept their illegitimate daugher Chloe hidden from them as long as they could.